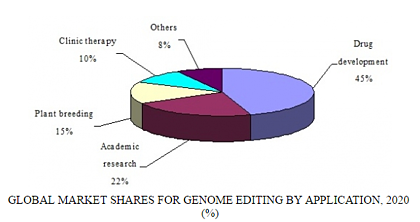 Genome editing technology is becoming more and more popular. Biotechnology advances in recent years have paved the way for a method to manipulate any DNA sequence — and even a single DNA base — in living cells or organisms in a faster, simpler, cheaper, and more specific way. In a new study, BCC Research reveals that the growth associated with technologies and applications for precise genome editing has exploded in the past two years. One breakthrough emergence has been the CRISPR/Cas9 editing technology. Genome editing is a type of genetic engineering technology in which DNA is inserted, replaced, or removed from a genome using engineered nucleases. It’s a logical next step to next-generation sequencing technologies and functional genomics studies to understand and manipulate genes. No doubt, CRISPR is a potential game-changer. However, if the method has been lacking, it has been in its ability to alter single bases of DNA. Until now, Cas9 has been used to break both strands of the DNA double helix at a specific site in the genome. Cells respond by healing the break, but tend to do so in a sloppy way, often inserting or deleting DNA bases. The result is usually a disabled gene. Hence it’s easy to use CRISPR/Cas9 to wipe out a gene’s function, but it has been difficult to fix a point mutation (caused by a change in a single DNA letter in a given gene) by correcting just the letter affected. In a new study, scientists at Harvard University say they’ve modified the CRISPR method so that it can be used to effectively reverse mutations involving changes in one letter of the genetic code. Because two-thirds of genetic illness in humans involve mutations where there’s a change in a single letter (or base), it’s a significant claim. The new method was just described in the journal Nature. In a nutshell, it relies on the same basic mechanism as the standard CRISPR method, but differs in that it doesn’t need to cut both strands of the DNA double helix to alter the genetic code. Rather, the base-editing technique can directly convert a single base of DNA to another without deleting and inserting random bases in the process. The researchers were able to genetically alter human and mouse cells to reverse single-base mutations that are associated with late-onset Alzheimer’s disease and breast cancer. The researchers think the new technique might eventually be able to edit human DNA to minimize the impact of the 25,000 single-base mutations that are associated with human diseases. The method could also be expanded to other enzymes. An alternative to Cas9, called Cpf1, was characterized last year and may be better for inserting sequences into genes. Two papers, which were also just published in Nature, shed new light on how Cpf1 works. One shows how the enzyme changes shape when bound to its guide RNA; the other describes a Cpf1 enzyme capable of cleaving both DNA and RNA. In fact, gene editing technology has existed for at least a decade. But older methods, which used meganucleases, zinc-finger nucleases, and transcription activator-like effector nucleases (TALENs), were complicated, slow, and expensive. CRISPR/Cas9 technology, which scientists began to use in human cells a few years ago, has impressed researchers with its low cost and ease of use. Overall, CRISPR is a lot more versatile, cheap, and precise than other gene editing methods. But although scientists have been able to use it to edit specific DNA sequences or insert new strands, CRISPR doesn’t do as well when it’s used for more delicate tasks, such as the substitution of a single letter described above. Thus the new Harvard study opens up a new world of possible gene edits to CRISPR researchers. Since the emergence of the CRISPR/Cas9 genome editing technology, the field has grown rapidly and it has had an impact on basic research, drug discovery and development, clinical applications, and plant breeding technologies. The exponential growth of the genome editing market also stems from its rapid expansion into many other application areas, including the food and the renewable energy industries. Nonetheless, the advances in precise genome editing for drug discovery and development can be limited because market approval of a drug takes a huge amount of investment and effort. The main reason for the low rates of market approvals for new drugs stems from the many uncertainties and risks that are inherent in the current drug discovery process. The use of precise genome editing technologies can discover drug candidates that elicit a specific therapeutic effect using more predictable and translatable cell and animal models. This would better fulfill the efficacy and specificity requirements of a drug and significantly reduce its side effects. In addition, the combination of precise genome editing technologies such as CRISPR/Cas9 and TALENs with stem cell technologies has opened an avenue that holds promise to significantly improve the physiological relevance of disease models used for drug discovery. Global revenues for the genome editing market, which reached $395 million in 2015, should surpass $2 billion by 2020, reflecting an impressive five-year compound annual growth rate (CAGR) of 38.9%. 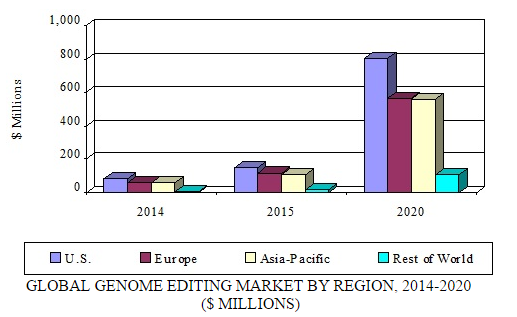 Although all regions involved in this market will experience fast growth at slightly different rates, the United States, which accounted for approximately 40% of the global genome editing market in 2014 and 2015, will continue leading the industry, with an estimated $806 million in revenues in 2020 and a five-year CAGR of 39.8%. Genome Editing: Technologies and Global Markets, BCC Research’s new study, examines the industry by technology, type, and end-user application. Global market drivers and trends are analyzed, as well as constraints; data from 2015 and projections of CAGRs through 2020 are presented. The story of genome editing will continue to unfold for some time, while the ethical and regulatory issues are debated. In December, the International Summit on Human Gene Editing declared in a statement that gene editing technology should not be used to modify human embryos that are intended for use in establishing a pregnancy. CRISPR has the potential to allow scientists to change the DNA in a viable embryo, which means the alteration could be passed on to that individual’s children. This is perhaps the biggest point of controversy—that CRISPR could allow us today to alter or direct the course of future generations. This powerful ability brings to the fore the familiar struggle to find a balance between science and ethics.